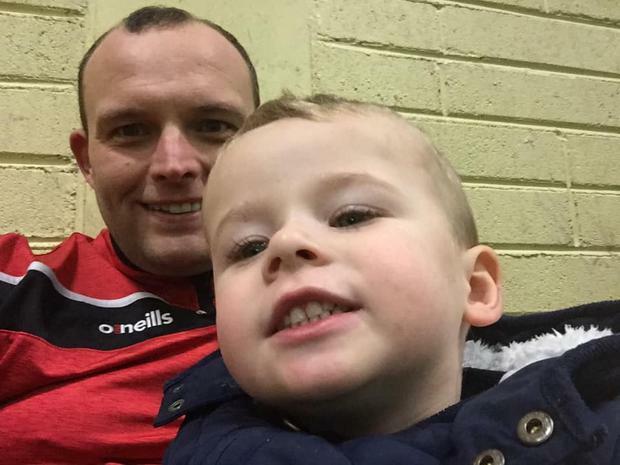 THE father of a three year old "little warrior" left seriously injured by a hit and run driver has admitted the four hours where Cork University Hospital (CUH) doctors battled to stabilise the toddler's condition were the longest of his life. Paul Higgins also slated as "heartless bastards" the driver and three occupants of the blue Mazda car that fled the scene after the accident in a Cork housing estate at 4pm yesterday. Thankfully, Paul said his son Zac (3) is now making a steady recovery in Temple Street Hospital in Dublin, where he was transferred overnight, though he remains in a serious but stable condition. Paul posted a special Facebook message to thank everyone who had sent messages of support to his family after the horrific accident off Cork's Skehard Road. "I would like to thank everyone who sent well wishes," he posted. "After the longest four hours in the CUH our little warrior hit the road to Dublin by ambulance. "He will love that when he wakes up to hear it. "He arrived at Temple Street Hospital straight for a CT scan which showed good results so far. "To see your child that way is the worst feeling I ever had in my life." Paul posted a special message to the driver and car occupants who Gardaí are now hunting in Cork. "To the rotten bastards that left him (my son) there I hope the four of ye in the car rot in hell ye heartless bastards [sic]. "But special thanks to all our friends in Castle Meadows who went above and beyond." Gardai are now examining a car to determine if it was the vehicle involved in the hit and run which left the Cork toddler in hospital with serious injuries. The youngster was apparently knocked down by a car in the Castle Meadows area just off the Skehard Road in Mahon/Blackrock as he was playing. Initial reports indicated the child may have run out of his front garden onto the roadside to retrieve a football. Gardaí said the vehicle involved then failed to remain at the scene after the collision. Pedestrians rushed to assist the injured child with paramedics on the scene within minutes. A blue-coloured Mazda saloon car was later found by Gardaí abandoned less than 2km away. The vehicle is now undergoing a detailed forensic examination to determine if it was involved in the incident. Former Lord Mayor of Cork, Councillor Chris O'Leary, is a friend of the little boy's family and appealed for anyone with information to come forward and assist Gardaí. "What happened with this young toddler was horrific and my deepest sympathy goes to his family who I know personally," he said. "I would ask people to come forward. I think the people who were involved in this should give themselves in." "I would also say to people - if you have information, if you have footage on your dash cam or your phone, please give that to the Gardaí and let them deal with it." "The Gardaí have been trying to piece together what happened and how it happened." "I would encourage the public to come forward - more importantly, to the individual who was driving, please come forward and give yourself in." Gardaí are investigating the full circumstances of the accident and have appealed to any eyewitnesses to contact them to assist their inquiries. Any motorist or taxi driver whose vehicle is equipped with a dash cam and who was in the general Skehard Road area is also asked to contact Gardaí. Garda forensic accident scene investigators are examining the area where the collision occurred.